Now this is exciting! 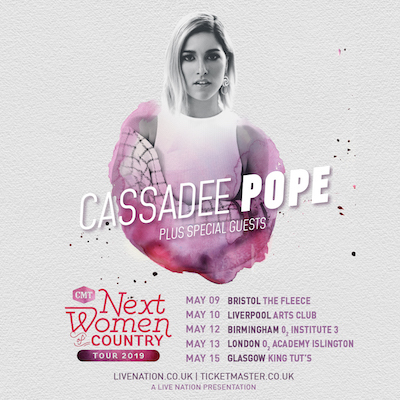 Not only do we get one of our favourites Cassadee Pope back in the UK for a series of shows but we finally and I say FINALLY as we are that excited, get the CMT Next Women of Country Tour in the UK. This is in addition to an eleven-date headline US tour under the same banner, starting April 11th in Pope’s home state of Florida, after she wraps her current national tour with Maren Morris. These dates will also mark her debut UK headline tour as a solo artist, following an appearance at C2C Festival 2017 and two performances as part of Country Music Week in London last year. Cassadee Pope is a Grammy-nominated, Platinum-certified singer-songwriter who has recently released her highly-anticipated second solo album STAGES, featuring hit singles “Take You Home,” “One More Red Light,” and “If My Heart Had A Heart.” From fronting rock band Hey Monday to winning season 3 of The Voice and releasing her #1 debut album Frame By Frame, Cassadee has effortlessly re-arranged the lines of country and pop. She has experienced tremendous success throughout her career, with her Platinum-selling single “Wasting All These Tears” being named “Breakthrough Video of the Year” at the 2014 CMT Music Awards and her #1 hit “Think of You” with Chris Young receiving a 2017 Grammy nomination for “Best Country Duo/Group.” Cassadee has toured extensively, joining legendary artists Tim McGraw and Dierks Bentley, playing London’s iconic O2 Arena during C2C: Country to Country Festival, and earning the distinction of the only country artist to perform at 2018’s Warped Tour. Cassadee recently performed “If My Heart Had A Heart” on the TODAY show, and is now on tour with Maren Morris on her GIRL: THE WORLD TOUR. Cassadee will continue touring throughout the spring as the headliner of the “CMT Next Women of Country Tour,” bringing the franchise outside of the U.S. for the first time ever. For more information about Cassadee, visit CassadeePope.com. A staunch advocate for country music’s female artists, CMT first launched its “Next Women of Country” campaign in 2013 in an effort to support and expose developing female talent, both signed and unsigned, in a male-dominated format. The campaign showcases emerging female artists across all CMT screens throughout the year, and in five years since its launch, CMT has expanded the initiative to include five CMT Next Women of Country Tours, anchored by superstar acts including Jennifer Nettles, Martina McBride and Sara Evans, a CMT.com digital series, Next Women of Country Live, and more. CMT is the leading authority on country music and lifestyle, offering a mix of original series, music events and specials. CMT is everywhere its fans are including two cable channels (CMT and the 24-hour music channel, CMT Music), radio (CMT Radio), digital (CMT App, CMT.com) and social (CMT on Facebook, CMT on Instagram and CMT on Twitter). CMT is a unit of Viacom Inc. (NASDAQ: VIA, VIAB).